The Japanese garden The Hague is only open 6 weeks in spring and 2 weeks in autumn. In 2018 spring opening is from 28 April till 10 June from 9:00 AM till 8:00 PM. Autumn opening will be from 13 till 28 October. Every time I visit the garden, I’m just overwhelmed by all the colours! There is one particular day in May which I book in my agenda and that’s the day of the Japanese market in Leiden. Last year I started my Japanese day trip in the Netherlands with a bike ride through Clingedael and a first stop at the Japanese garden The Hague, from there I cycled part of the The Hague estates route and then from Wassenaar to Leiden. In Leiden centre I parked my bike close to Rapenburg and visited the Japanese market. This year I have planned a bike tour on Sunday the 20th of May including a facts & fiction tour to the Japanese Garden The Hague, a couple of stops in the nature in The Hague/ Leiden area & a visit Japan Market Leiden. 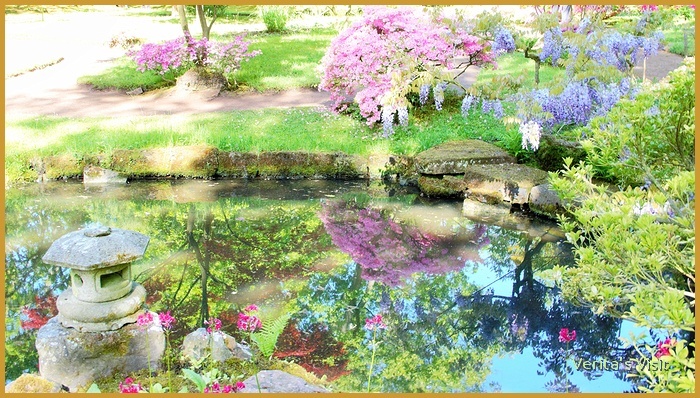 The Japanese garden is the most famous of the gardens in Clingendael. It attracts over 10.000 visitors a year. One of the reasons why it is such an attraction is definitely the multitud of colours. The colours of the Japanese maples, azaleas are splendid in spring as well as in autumn. And then there is the red bridge, one of the most picturesque and most photographed objects in the garden. Colours as well as objects have a special meaning in this garden. Shinto is an ideology, religion and way of life which is strongly rooted in Japanese society. The design, the ornaments, the colours used in the Japanese garden The Hague all have a symbolic meaning. Do you feel joy and peace at the moment you see the red bridge? That is just the intention of the designer of the garden. According to Shinto the colour red is used to chase away all the bad spirits. Seeing the colour makes you feel happy. If you pay attention, you will also see a lot of red on the Japan market in Leiden. This year the celebration of Japanese culture, food, music and arts takes place on Sunday, 20 May. Hope to welcome you on the facts & fiction Japanese garden & market bike ride Sunday 20 May! Just drop me a line if you want more info.